SMD-Stencils (solder paste and adhesive stencils) are an absolute necessity for SMT circuit board assembly. SMD stencils from Multi-CB are manufactured using laser technology, which ensures a constant process quality through its high level of precision. Our SMD-Stencils fulfil the most stringent quality requirements with optimal register accuracy and cutting precision. The precise axial tolerance of ± 2µm and a repeat accuracy of ± 3µm offers optimal conditions for solder paste printing, even for the smallest high-tech components. In addition, the pads on laser-cut stencils have a slightly conical opening towards the circuit board side, thus providing for optimal release behaviour for the solder paste. Thanks to the carbon fiber axis setup, the cutting speed per system is a realistic 20.000 pads per hour. The innovative Real-Time Process Control-System checks each pad (Aperture) for completeness and correct dimensions, in real time. On request we will gladly apply the necessary mounting holes (perforation) to your stencil for loading into all popular, license-free quick clamping frames (also quick-tension system, stretching frame) and self mounting systems. A quick clamping frame replaces the solid aluminum frame. The SMD-Stencil is used as required and pneumatically (rarely mechanically) brought to an even tension. If your system is not yet included in the calculator, please contact us. Quick clamping frames for SMD-Stencils are a cost-effective and space-saving alternative to stencils in fixed frames. 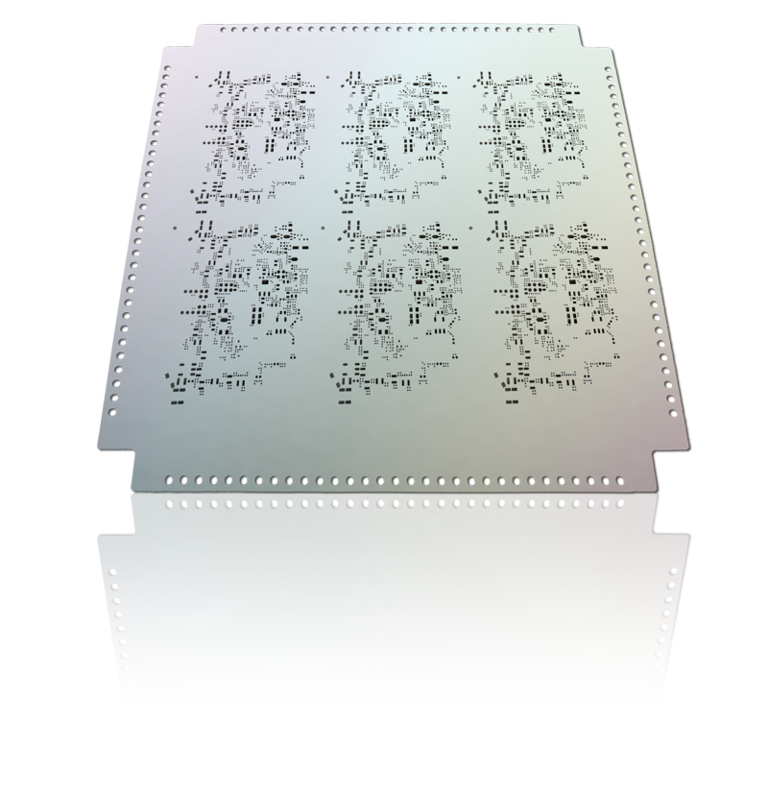 The mounting holes are lasered together with the SMD pads in one go, so there are no additional tolerances between pads and holes. Please note: Multi-CB only optimizes your data for the quick clamping frame, selected in the SMD-Stencil Calculator. The frame itself is not part of the offer. As a complete solution including frame please choose DEK VectorGuard.